If you play your cards right, something like a rediscovery of an old but alluring unfinished project could be your outcome. 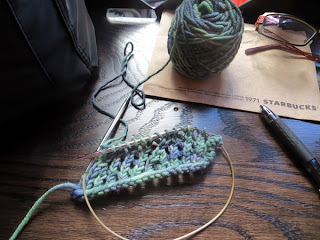 The key to fitting knitting into every nook and cranny of your day is: have knitting with you at all times. That can be tough if you routinely knit large, complex sweaters that require a lot of yarn plus diverse, hard to replace tools... or if you are monogamous to each project and finish one before even buying yarn for the next in which case I envy your pristine yarn storage enormously. However, if increasing your productivity or Zen time is important to you, you can perhaps justify cultivating a love for smaller easier projects as a means to that end. 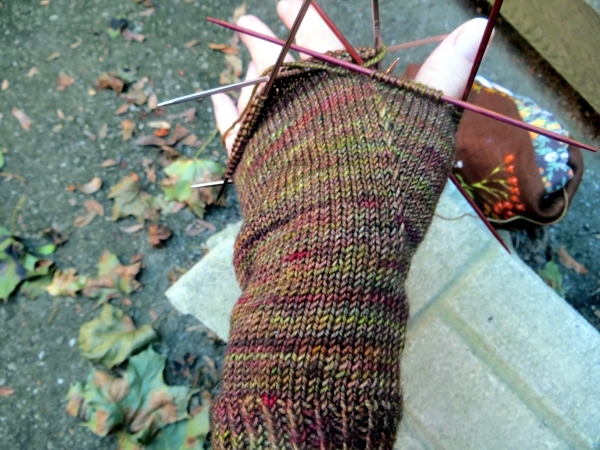 There are a number of ways to ensure you have knitting with you. If you are Trish, you always have a bag of some big knitting project (or maybe just a really awesome huge cowl) by the door. Trish never seems to mind carting around an extra bag if it's for a worthy cause, which knitting definitely is, and as a result she is always able to settle in anywhere and be productive with minimal planning. I should note as well that Trish doesn't even bother with pretty, petite metal and bead stitch markers that get lost in the bottom of the bag or in the grass at some outdoor event and cause pain and heartbreak when they do; she twists one of those plastic or paper-covered wire bag closures into a circle and uses that. Those things are so much easier to spot, and also, to replace. If you are me, you resent having to carry even one thing, so you always have a very compact knitting project with lots of mindless stitches in its future already tucked into a messenger bag that lets you keep your arms entirely free. You're also now 100% equipped to knit while walking. Bonus! Yesterday I discovered that, for various boring reasons, I had to get my car downtown way earlier than I personally needed to be there. 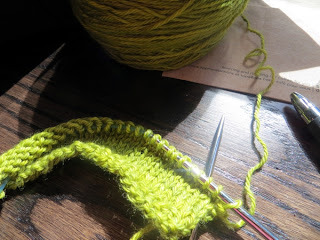 Normally my thoughts would default to shopping, but this time I was strong and thought instead about how I could most compactly use that dead time to take care of some work-related knitting tasks. And then I took my knitting on a date*. A date is different than a party. At a party - you know, the ones where you get together with a bunch of friends or fellow crafty fans in a yarn shop or somebody's house or a bar - you concentrate on the other people as much as on the work in your hands. On a date, you are focused entirely on your own knitting. You are getting to know it better and to love it more. You are not taking breaks to look up other patterns you might want to knit, or to put in a load of laundry, or take care of any other mundane tasks that get between you and your yarn. 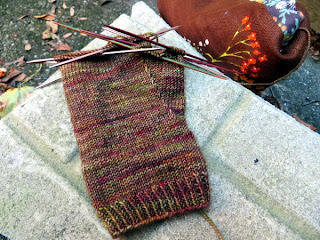 and did the very necessary gauge swatch for hat #2. Both of these tasks would have been hugely boring if I'd tried to do them at home surrounded by unfinished laundry and a messy kitchen counter, instead of in a Starbucks listening to the lady behind me make one full hour's worth of phone messages (plus the occasional actual conversation) to invite people to the launch of her new food-based business. I'm not being sarcastic - that woman was a machine! She wasn't irritating at all but just so methodical and professional and did not hesitate to dial number after number. I hope she does well. And I kinda wonder whether she was taking her project on a date too. * Taking this particular knitting on a date meant carrying a dedicated bag, which as I mentioned earlier is not something I love. So when the date and my coffee were both done, I put the bag back in my car and then, ahem, went shopping. When knitting in a mobile situation - and this may seem obvious but is worth stating - it is essential to keep your hands on your work. See how I repeated that core message from the title of this tip? Don't, for example, put it down to read a magazine article that beckons from the table beside your chair in a waiting room. Even if that article is going to reassure you that your province or state has fewer traffic accidents than any other in your country. By keeping your hands on your work - and, more specifically, on your work bag - you will avoid picking up a message hours after leaving said waiting room from somebody who picked up that bag from the floor, and thought it might be yours because there was a sock inside it, and probably you can come and pick it up again in a few days because it's been put aside safely. Or worse: not getting such a call at all. Ugh, it doesn't bear thinking about. By keeping an eye out for compact patterns and projects that interest you, you can always be prepared to replace any (temporarily, I hope) lost mobile knitting. Even starting and then getting distracted and not finishing such projects can be helpful. That is how I rediscovered the little gloves I started knitting last winter, and didn't finish because the weather was getting too warm for them anyway and also, I had to pack for the Italy trip. The first one is already at the porcupine stage and not at all appropriate for mobility. Have a marvelous weekend of knitting, whether it's out or at home, and I will see you tomorrow! I use those little round thingys that come with your electric toothbrush...4 colors great for lace knitting too. Ohhh, love that idea Darlene, thanks for sharing it! Lol! Of course, my habit of big knitting bags stems from my habit of sweater knitting - and the fact that pretty well everyone knit-worthy in my life is not tiny and compact. I miss the infant days! Love the yarn that your using for project! Do you have the name of it? Erika, I'm guessing you mean the gorgeous Viola yarn (colourway: Orchard - happy sigh) of my handwarmers - sadly Viola yarns aren't dyed any more but sometimes you can find somebody on Ravelry who is willing to destash a bit!